Buy a Toro Power Shovel and we cover the shipping! 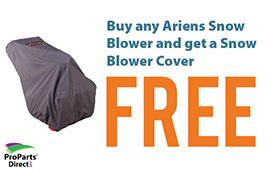 Buy an Ariens snowblower and we'll give you the cover, FREE! Order ANY snowblower parts and get 2 free shear pins. 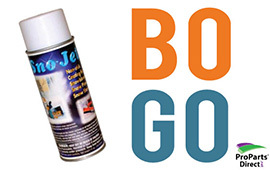 Finally, Buy one can of SnoJet snowblower spray and get one free! 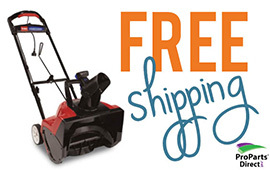 Buy an Ariens snowblower online and get a cover free! The Ariens Sno-Thro cover is tear resistant and will keep your machine protected from the elements. Offer valid while supplies last. 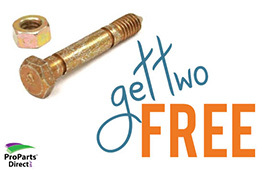 Get 2 Free Shear Pins! It's time to Tune-up your snowblower! Order any replacement snowblower parts and we will throw in a couple of shear pins for FREE.